Saturday September 11th 1897 Fanny took me to town this morning to do some errands but we got home early. Will came before dinner. After a good visit we came home in time to do the evening work. weather a little cooler. Sunday September 12th 1897 I read some after I got the morning work done and in the afternoon wrote a couple of letters and went over to Em Weldies a little while. After doing the evening work Will and I sat on the porch and talked till bed time. It was a beautiful moonlight night. It was 25 years tonight since Will was married the first time. we talked of that night. 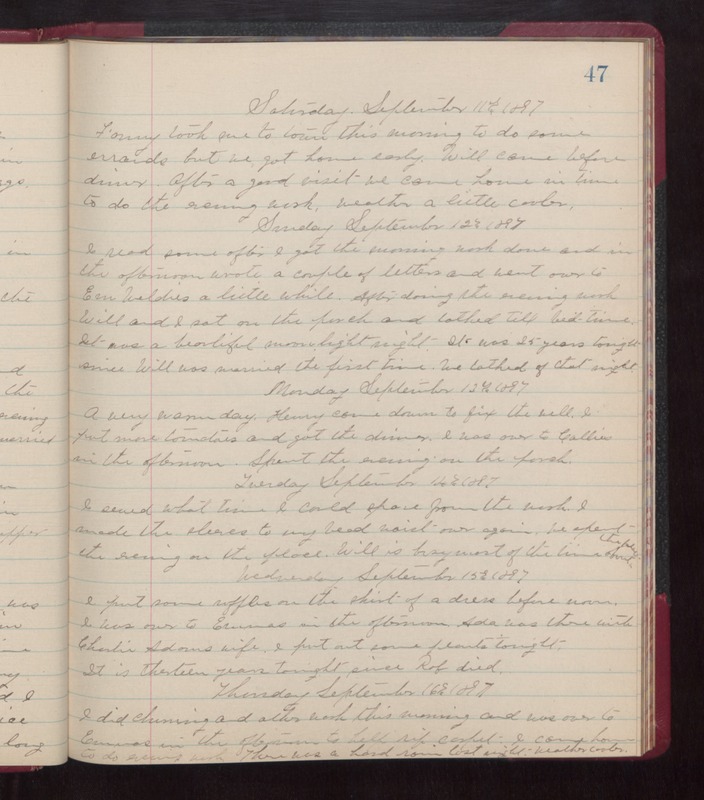 Monday September 12th 1897 A very warm day. Henry come down to fix the well. I put more tomatoes and got the dinner. I was over to Callies in the afternoon. Spent the evening on the porch. Tuesday September 14th 1897 I sewed what time I could spare from the work. I made the sleeves to my bead waist over again. we spent the evening on the place. Will is busy most of the time about the place. Wednesday September 15th 1897 I put some ruffles on the skirt of a dress before noon. I was over to Emmas in the afternoon. Ida was there with Charlie Adams wife. I put out some plants tonight. It is thirteen years tonight since Rob died. Thursday September 16th 1897 I did churning and other work this morning and was over to Emmas in the afternoon to help rip carpet. I came home to do evening work. There was a hard rain last night. weather cooler.